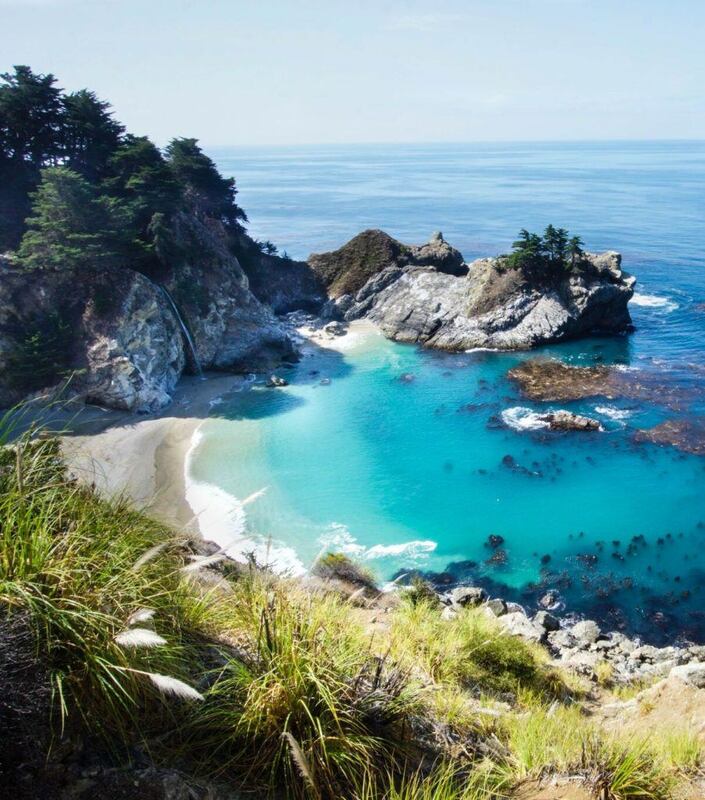 What comes to mind when you picture vacationing in California? Is it the dazzling lights of Hollywood, the Fisherman’s Wharf in San Francisco, or the stunning Pacific Coast Highway? These are all incredible things to see in their own right, but there’s another adventure that many overlook: The deserts. The Alabama Hills is a popular place for shooting movies, particularly old western flicks. There are plenty of arches, short hiking trails, and BLM camping spots. Departing from Los Angeles, take the 395 up to Lone Pine, the gateway for the Alabama Hills and Mount Whitney, the highest summit in the lower 48. This is the most popular feature in the national monument and you still might just get it all to yourself at primetime, which is sunset. You can watch as the sun sets through the arch and over Mount Whitney. At night, this is another great spot for photography as you can often get the Milky Way through the arch. This arch is, you guessed it, shaped like a boot! It’s easy to reach from an offshoot of Movie Road. Though the road says it may not work for low clearance vehicles, in good weather an SUV should be fine even if it’s not a 4×4. The cyclops Arch is nearby as well. Most of the things to see are offshoots of the movie road. This is a dirt road, but unless it’s particularly muddy, most cars will have no problem driving on it. You can camp anywhere within the hills that is not visible from the road, however there are no facilities, just like any other BLM campsites. Always pack out everything and leave no trace. Alternatively, check out the Best Western Plus Frontier Motel in Lone Pine. I stayed there and thought it was great! For more on the Alabama Hills, check out this post. Death Valley is hauntingly beautiful and otherworldly. It may seem like life could hardly exist in the hottest place on Earth, but this is where nature really comes alive with vibrant colors and dramatic vistas. From the Alabama Hills, it’s about a 2 1/2 hour drive to Death Valley’s more famous attractions. 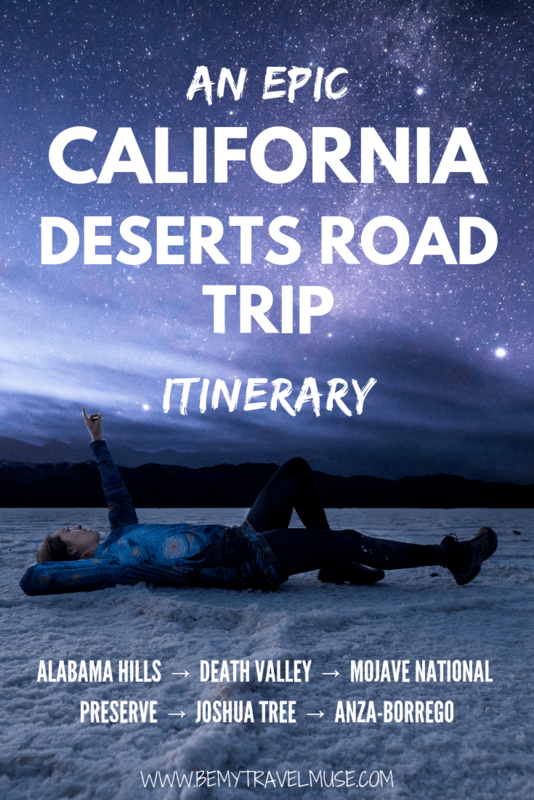 While Death Valley can quite literally be lethal in the summer, with the hottest temperature ever recorded on Earth (134°F/56.7°C), the winter is the perfect time to go for much milder temperatures. In a park as huge as Death Valley, this is far from an exhaustive list, but these are some of the highlights. For both sunrise and sunset, this overlook is perfect to see the badlands change color as the light hits them in the morning or fades behind at sunset. It’s a super easy walk up to the viewpoint from the parking lot. If you’re a photographer and want a good spot, stake it out early as this is the most popular photography location for sunset. I highly recommend walking from Zabriskie Point around the Golden Canyon to the Red Cathedral and back past Manly Point. It’s one of the most beautiful hikes I’ve ever done, and not too difficult, though it does take a few hours to complete. Bring plenty of water and wear sunscreen. This is another easy, super short hike to the viewpoint. Imagine minty green and pink rocks in layers. This is great for golden hour or just after the sun sets. The Badwater Basin, which sits below sea level and is the lowest point in North America, makes up a large part of the park and is incredible for stargazing, or during a full moon. It’s a flat and easy walk out to them from the main viewing area and from there you can go as far as you please. This is a great spot to watch the sunrise, just plan in plenty of time because dune climbing can be a challenge! For an incredible viewpoint higher up over Death Valley, head here for stunning views. The Oasis at Death Valley is a gorgeous hotel with a lovely restaurant and perfect positioning for the main attractions like Zabriskie Point. I loved the 1920s old western theme. This will be the first stop if heading in from Death Valley via Baker. This one is a short walk from the parking area down into the lava caves where you can see beams of light shining through at certain times of day. When I went at 1pm, lights were shining through one of the tubes, but not the biggest one. I met someone down there who had been waiting since 10am to see the light beam, but hadn’t had any luck. Time of day matters but time of year may also play a role. The road out is washboard and dirt with sand in some places. I personally did not think a non-4 x 4 would be a good idea, however right as I parked my truck rental I saw a Prius, so it must be possible! Is it Namibia? Nope it’s California! Admittedly, until Apple came out with the Mojave update for my computer, I had no idea that there were dunes in California that looked like the ones in Namibia! These are incredible at both sunrise and sunset, and are accessible with a normal, non-4 x 4 car as long as you stay on the tar road and don’t continue onto the sand. You can walk around the rim, it’s a pretty sweet view! On your way out of Mojave towards Joshua Tree, stop by the crater for a hike up to the rim for an amazing view for miles. Take caution to only do this in the winter, as the lava rocks can get incredibly hot. An Instagram favorite, Roy’s Motel Cafe and Ghost Town is on Route 66 right at the turnoff for Joshua Tree. There’s not much there these days apart from some incredibly expensive gasoline, but it’s a fun little photo stop. There are no hotels within the national monument, so I recommend bringing a tent and camping out. There are spaces near the base of the Kelso Dunes. Per usual, pack everything out and leave no trace. This is an easy and nice walk that takes you past several Joshua trees as well as a dam that has water for at least part of the year, creating a nice reflection. The stargazing is pretty good in Joshua Tree, not to mention the perfect foreground that the trees create. This park really comes alive at night, and at sunset, sunrise, and golden hour. For something a little different, head to the Cholla Cactus Garden for a nice walk that takes you past some different kinds of flora other than the Joshua trees. Twentynine Palms is right by one of the entrances to the park in the perfect place to stay. It’s a quirky town and there’s some great food, too. I really enjoyed The 29 Palms Inn. Alternatively, there are campsites within the park. This must be the best sunrise in all of California, seriously! Watch as the sun rises over the badlands lighting up as far as the eye can see all the way to the Salton Sea. You need a 4×4 for this one, though you can hike to it. It’s flat, and it’s mostly the areas closer to the actual point with deep sand. You can either hike out to these if you don’t have a 4×4, or take a drive if you do. It’s a series of bubble shaped wind caves that are low to the ground and easy to miss, so keep a lookout for the sign. I felt like a prairie dog running around these! The stargazing was unreal here as well. There’s no bad spot – this was taken at Font’s Point. There are plenty of places where you can camp within Anza Borrego. Once again, there are rarely facilities so leave no trace. Though it goes without saying, the desert can get incredibly hot and dangerous in the summer months. However the autumn, winter, and spring can be fantastic times to visit. If you’re into stargazing, summer can still be a perfect time to go, particularly during the Perseids meteor shower. Prepare for freezing cold temperatures as well, as temperatures plunge at night, particularly in the winter. Since a cell signal can be hard to come by, always bring an extra tire and plenty of water, and I highly recommend downloading off-line maps to Maps.me with your locations plotted ahead of time. This worked great for me out there, particularly for hiking trails, though sometimes it overestimated the time needed to drive between places. Additionally, make sure you keep your gas tank full and fill up whenever you get a chance. Gas is well priced in Baker and decent in Lone Pine, and surprisingly cheap in Stovepipe Wells at the entrance of Death Valley. But try not to fill up anywhere else in the area or it can get up to five dollars per gallon! The desert is a particularly vulnerable environment, so please practice Leave No Trace principles. Stay on trail, pack out all of your trash including human waste, and when there is no trail, look for where there are already footprints to minimize your impact. You can read more here. Did you know that California had so many beautiful hidden places? This is one of my favorite road trips in California, particularly if I want to get away from it all. At the beach it’s all about the ocean, in the forest it’s about the trees, but in the desert it’s about the land. The way it all changes depending on how the sun hits it blows me away every time. There’s nothing like the quiet, and colors, and incredible landscape of the desert. *This post was brought to you in partnership with Visit California. Itinerary and opinions of the inanely gorgeous California desert are my own.